PATRICIA De Lille, is now beginning to confuse some of us. Irreparable love. WC Mayor Patricia de Lille and ‘boss’ Helen Zille during happier times. Now both are at odds. The Cape Town Mayor had an agreement with the Democratic Alliance that she would resign at the end of October 31 2018, after her meeting with DA leader Mmusi Maimane. Everyone had hope by today October 31 she would be handing over the Council’s Chain and its belongings and pursue her career, but that is not to be. Law firm Bowman Gilfillan‚ conducted a 10-month investigation centred on the Cape Town transport authority‚ recommended that De Lille be reported to the police for allegedly attempting to prevent former city manager Achmat Ebrahim fulfilling his legal duty to tell the council about allegations of misconduct against transport commissioner Melissa Whitehead. 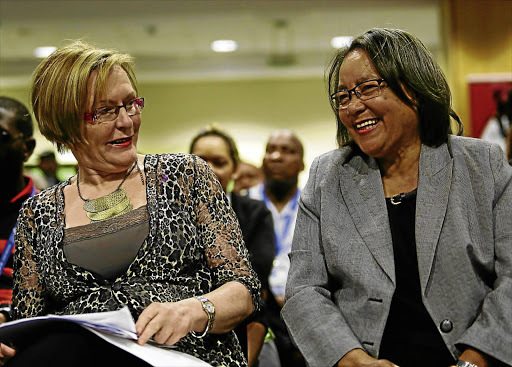 Both De Lille and Herron now face criminal charges laid by the DA. Meanwhile, Mayor-Elect Dan Plato must be sworn in as a councillor on Thursday the 1st of November in preparation for him to be nominated as the Mayor of Cape Town. By end of today Wednesday 31 October we shall await aunt Pat’s decision to -resign or not to resign. Or perhaps she enjoys playing chess game with the DA, who knows?